Often people invest in fixed deposit options because they are not subject to market fluctuations, unlike other market options. These low-risk high return features make the fixed deposit a popular investment option. In a fixed deposit scheme you can invest money for a stated period of time after which a fixed rate has to be paid until the end of deposit term. Bank of Baroda fixed deposit options offer a great variety in terms of interest rates and deposit periods. The above rates are applicable for deposits of below Rs. 1 crore. Loan facility against FD amount can be availed. The minimum amount that can be deposited in a short-term fixed deposit is Rs 1000 for a duration of 15 days and above. For a period of 7 days, the minimum deposit amount is Rs 100. The maximum amount that can be deposited is Rs 25 crore. Maximum deposit period is 120 months. However as an exception to this rule, for institutions, companies, government bodies the deposit period can be more than 10 years but maximum cannot go beyond 20 years. A fixed deposit can be opened online at your own convenience by filling an online application form. FD account can also be opened by visiting your nearest Bank of Baroda branch. 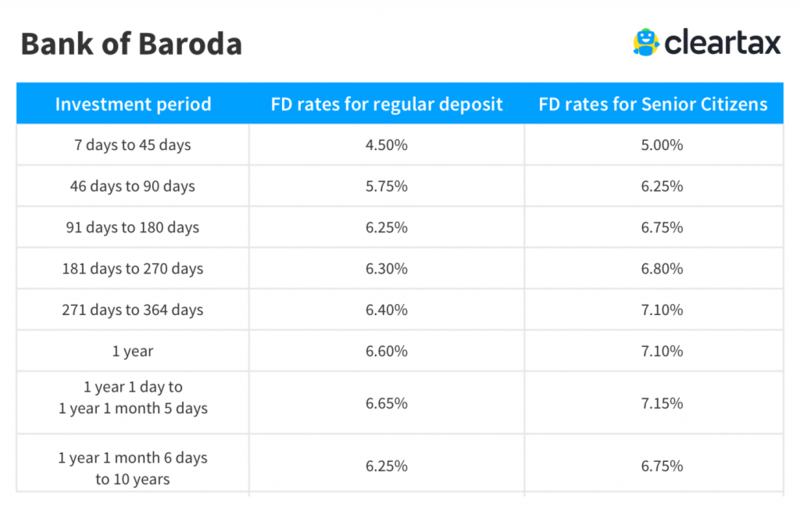 Bank of Baroda Fixed Deposit: Is it the best way to save? Investing in fixed deposit schemes is a popular saving option chosen by a large majority of people as it offers security and high returns. Bank of Baroda offers attractive FD schemes with competitive interest rates. Although investing in fixed deposit schemes offer a level of security, this might not be an ideal option in terms of wealth creation. Hence, other options like investing in mutual funds must be explored as well. The advantage of investing in mutual funds over fixed deposits primarily is that they are managed by professional fund managers who make informed financial decisions to ensure you get the highest returns. This mitigates the risk that mutual funds come with to a large extent. There is less liquidity in the case of fixed deposits till the deposit tenure is over, on the other hand, mutual funds over higher liquidity in case the lock-in period has been crossed. The return rates for fixed deposits are fixed for a particular deposit tenure however in case of mutual funds you can get almost 2x more returns in a positive market. Premature withdrawals can be made in case account has to be renewed for a better interest rate offering scheme and no penalty will be levied in this case. The penalty is not charged if the face value of the deposit is less than 5 lakhs and the deposit has been for at least 12 months. In all other cases of premature withdrawal, 1% interest would be deducted from the original contract rate at the time of account release. Bank of Baroda has a tax saving fixed deposit option with a deposit lock-in period of 5 years. Individuals, minors, and HUFs are eligible for this. You can go for this fixed deposit scheme to avail tax benefits under section 80C of the Income Tax Act,1961. However, it is important to note here that in case of fixed deposits, tax levied is dependent on the tax bracket you fall into irrespective of FD tenure. If the interest earned on your fixed deposit is more than Rs 10,000, TDS deduction of 10% would be deducted by the bank. Mutual funds have an edge over fixed deposit in this regards as tax payable on mutual funds depends on the category. For example, returns on equity funds like Equity Linked Savings Scheme (ELSS) are tax-free and upto 1.5 lakh can be claimed under section 80C of the Income Tax Act,1961.Also, long-term capital gains on equity mutual fund units held for more than 12 months are tax exempt. They offer a higher capital appreciation potential and a smaller lock-in period of 3 years. Hence we can say investing in Mutual funds is viable tax saving option. Fixed/Short Term Deposit– A standard FD scheme offered by Bank of Baroda wherein customers are paid fixed interest amounts at regular intervals. You can also choose to receive payment at the end of the maturity period.